The Chairman of the CAN 2008 Local Organising Committee (LOC), Dr Kofi Amoah has said the budget for the organising and hosting of the 26th African Cup of Nations (CAN) be made available soon to enable the committee to meet its schedule. He said as part of the schedule two new stadiums at Tamale and Sekondi would be built as well as the refurbishment of Accra and Kumasi stadiums. 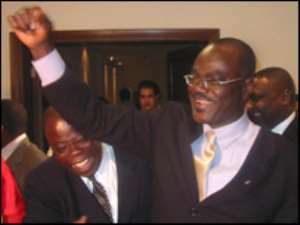 This he said was necessary to avoid a "debilitating disconnection between what is an excellent vision and the implementation of that vision," and adds that the 15-member LOC would need the support and partnership of the media, political, traditional and business leaders in the host venues and the entire citizenry of Ghana. "This is an exercise to showcase our nation to the world and put it in the best possible light," he said and urged all Ghanaians to use sanitation as their mantra to play their various roles to usher us into a needed renaissance that will give birth to that shinning and clean New Ghana ready to take its place in the 21st century." The Vice President, Alhaji Aliu Mahama in his inaugural address advised members of the LOC to desist from acts that would amount to conflict of interests in the discharge of their duties to ensure a successful organisation and hosting of the tournament. Alhaji Aliu Mahama charged the Kofi Amoah Committee to plunge into work to be able to meet the deadlines and requirements set by the Confederation of African Football (CAF) and save the nation the embarrassment and expensive ventures of rushing through contracts and projects at the last minute. The LOC, among other things, is tasked to raise and manage funds through commercial and sponsoring activities and all proceeds from matches and other promotional activities for the competition, advise the relevant ministries, departments, assemblies and agencies on their respective roles and obligations. Alhaji Mahama said he believes that given the experience, expertise and resourcefulness of the members, the nation would be able to depend on them for the successful organisation and hosting of the tournament, advising them to count on the experience of other notable countries who have successfully staged the competition in recent times. The Minister of Education, Youth and Sports, Kwadwo Baah Wiredu on his part said with the inauguration of the LOC, the way has now being paved for work to begin in earnest as 16 countries, mostly international firms have already submitted their bids for constructional works.